It just got easier to build code-compliant masonry fireplaces and chimneys. The new International Residential Code (IRC) is better written and easier to understand than ever. There really is no longer any reason to rely on a proprietary or listed system just becasue the code is so confusing. The code is not confusing any more. Any mason, builder or building official can understand it. The best, longest lasting, highest quality fireplaces and chimneys are still built with masonry - built to code. Masonry fireplace and chimney construction is regulated by the building code. Unlike UL or some other "listing" the building code is not proprietary. The sections which regulate residential construction are "prescriptive" so that they can be understood and followed by a contractor or craftsman without needing to hire an engineer. The several "model codes" that used to be used in the United States (BOCA, NFPA, UBC, SBCCI and One and Two Family) have all being merged into one new International Building Code (IBC) and it's residential counterpart, the International Residential Code (IRC). This has been a major ten year long effort and now the 2006 IRC is in print. The part that regulates fireplaces and chimneys - is on line at CHAPTER 10, CHIMNEYS AND FIREPLACES. In addition to the building codes, most states and some local jurisdictions and once in a while the federal government sometimes adopt or enact various energy, indoor air quality and emissions regulations, all of which are generally enforced by the building official. Generally, the IRC is a better code than any of the old model codes that it has replaced. It's more logically organized, more integrated with the rest of the code and more clear on long-confusing issues such as clearance to combustibles and flue lining installation. It's a better code for masonry because masons, builders and code officials alike can more easily understand and apply it. Here we will try to outline only the most important features of the IRC - clearances to combustibles and clay flue lining installation. Other issues are important too such as smoke chamber wall thickness, the referencing of many ASTM standards and a complete re-write of the seismic design sections, but, you know, space. Since there are many changes it's more important than ever to get a current copy of the IRC and read it. All is NOT the way it used to be. R1001.11 Fireplace clearance. All wood beams, joists, studs and other combustible material shall have a clearance of not less than 2 inches (51 mm) from the front faces and sides of masonry fireplaces and not less than 4 inches (102 mm) from the back faces of masonry fireplaces. The air space shall not be filled, except to provide fire blocking in accordance with Section R1003.13. Current code on clearance to combustible materials from masonry fireplaces is basically one unbuildable paragraph with four exceptions. It is noteworthy that the clearance at the back of the firebox was increased from 2" to 4" based on evidence that the "hot spot" is right behind the fireplace. If the fireplace is proprietary and listed, some manufacturer has taken responsibility for it and Exception 1 allows any exception sanctioned by the manufacturer of a listed system. Exception 2 permits masonry fireplaces which are part of masonry walls to be in contact with combustibles provided the combustibles are at least 12" from an interior flue lining. This language allows thickness and mass to compensate for clearance. Exception 3 allows combustible trim, flooring and siding to touch the masonry repeating the 12" distance from an interior lining surface rule and reinforcing the principle of thickness and mass as a substitute for air space. 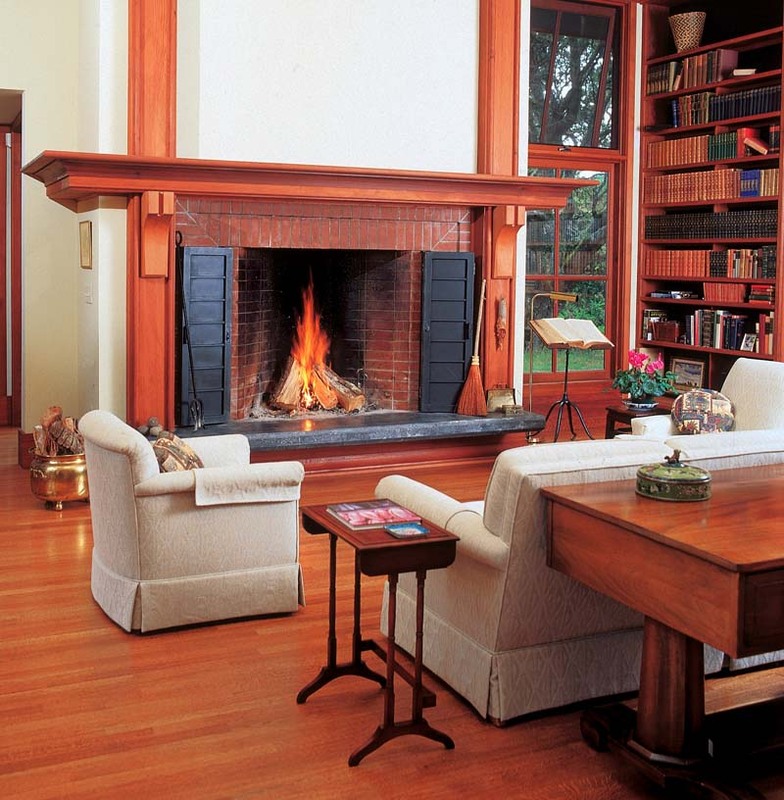 Exception 4 allows mantels and trim on the front of a fireplace to be as close as 6" to the firebox. This was in the old codes but read more as a contradiction than an exception. R1003.18 Chimney clearances is the parallel section dealing with chimney clearances. In summary, it's now easy to just make sure your fireplace walls are at least 12" thick and you can forget about clearances since all the trim such as baseboards, flooring, etc. can abut the masonry and be at least 12" from the interior lining surface. The old idea that thickness, mass and heat dissipation are fire protection strategies that may compensate for clearance is important. Another principle is also important but is not stated. It's the idea that combustibles that are exposed such as trim, siding, mantles and flooring, are not as dangerous or insidious as combustibles like the framing you can't see. The idea that the chimney could be bare (at least not totally enclosed with framing) and that trim could touch it here and there would be safer is implied if not stated. It's the way houses used to be built. R1003.12 Clay flue lining (installation) Flue liners shall be installed in accordance with ASTM C 1283 and extend from a point not less than 8 inches (203 mm) below the lowest inlet or, in the case of fireplaces, from the top of the smoke chamber to a point above the enclosing walls. The lining shall be carried up vertically, with a maximum slope no greater than 30 degrees from the vertical. Fireclay flue liners shall be laid in medium-duty refractory mortar conforming to ASTMC199 with tight mortar joints left smooth on the inside and installed to maintain an air space or insulation not to exceed the thickness of the flue liner separating the flue liners from the interior face of the chimney masonry walls. Flue lining shall be supported on all sides. Only enough mortar shall be placed to make the joint and hold the liners in position. For the first time flue liners are to be laid in refractory mortar. The code is not specific but it should be non water soluble refractory mortar - the hydraulic high temperature mortar that comes in a bag and you mix with water, not the premixed refractory mortar in a can or bucket which may dry but will always remain water soluble. The second big change is limiting the air space around the flues. an air space or insulation is needed as a bond break but, especially in seismic areas, the officials don't want so much air space around the flue liners that they may shift and spill flue gasses. It's no big problem if you use standard flues (sizes 9", 13", 18", 21") with standard brick or modular flues (sizes 8", 12", 16" 20") with modular brick or block. But to use standard flues with a modular enclosure usually results in too much space around the liners which now must be filled. Clearances to combustibles and clay flue liner installation are but two of the important changes in the building codes for fireplaces and chimneys in recent years. There are many other changes, mostly that make masonry fireplaces and chimneys easier to build and better able to compete with the ubiquitous and inferior "other material". Get a copy of the International Residential Code from the International Code Council (ICC) 888 ICC SAFE (422 7233) and get back in the business of building masonry fireplaces and chimneys. They last 100 years longer.